The 9th of May is known in Europe as Victory Day, or plainly as May Day. It marks the end of World War 2 in Europe where the Allied forces defeated the Axis power in the year of 1945, bringing years of suffering and atrocities to an end as peace reigned over the continent. Since then, this day was celebrated annually in almost every country in Europe. World War II is more commonly known as The Great Patriotic War in Russia. It was a war so terrible and devastating that many Russians likened it to the complete extermination of the Russian race, should Hitler's army capture Moscow. With casualty of more than 27 million Soviet lives at the end of the war (easily surpassing Malaysia's population today), it was a do-or-die decision for all Soviet citizens. Victory Day in Russia in particular is celebrated in a grandious manner. It is a national holiday much similar to Malaysia's Independence Day, but unlike our bloodless struggle of independence from the British Empire, Victory Day symbolises the victory of Soviet Socialists over Nazi Facists through the strength and determination of the working class. 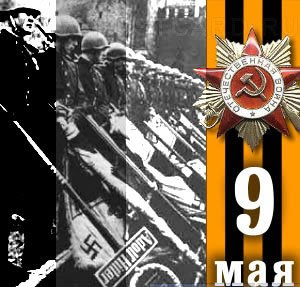 The emblem of the Great Patriotic War & 9th May. The black-and-white photo shows Soviet soldiers symbolically disposing of Nazi standards at the Red Square in Moscow. Back in the heyday of the Soviet Union, huge military parades were held yearly to commemorate this significant day. Endless columns of war machines would rumble pass the ranks of marching soldiers of the Red Army, and their leaders would salute them gloriously from the heightened podium as the military band played vigorously. Heavy vehicles carrying weapons of mass destruction rolling through the Red Square to the delight of its spectators. The Victory Day Parade was celebrated not only in Moscow, but in nearly every major city and town in Soviet Union. Besides paying tribute to the heroes of World War 2, it also the raised patriotism, and strenghtened faith and confidence in the country's ability to defence itself. The world too would observe mindfully over the potency of the military of the Soviet Union – the message is clear: Don't mess with the USSR. The Red Army marches on on Victory Day. After the collapse of the Soviet Union, the Victory Day military parade in modern Russia was toned down much to the acceptance of the world to show the obviation of old communistic ways. 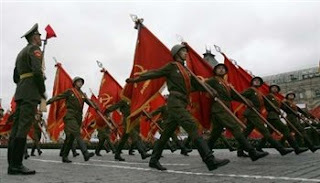 Until the recent year, Victory Day parades were mainly of the army marching. 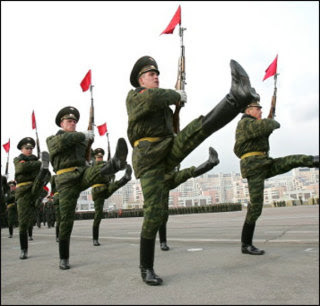 Russian soldiers goose-stepping with much dexterity at the modern day parade. Further away from the capital, the people of Kursk also celebrated Victory Day, albeit in a more sober fashion without the pomp and grandeur of Moscow. The day started of at about 9:30 a.m. at the junction of Karl Marx Street and Lenin Street. When I arrived at the scene, people had already gathered and the crowd was ballooning by the moment. People were wearing ribbons of orange and black stripes and holding flowers. Young cadets to the fore with wreaths. Karl Marx Street was closed off from motorists in the morning to make way for the march. At exactly 10:00 a.m., the march began with the military band leading crowd. The customary brass band. I have a feeling that they are the same guys on Labour Day. Following closely behind the brass band were officers bearing flags of the military, the country, the former Soviet Union, and the state. Colourful flags decorated the formation. Most of the participants at the head of the march were war veterans dressed smartly in their uniforms, widows and widowers of the fallen, important people and senior citizens. Flowers and medals, don't leave home without them. The second contingent following the march was, of course, Medvedev's own political party – United Russia. The crowed was awashed with the colours of red, white and blue; the evident presence of who's in charge. Where there is the ruling party, the Opposition would closely follow. Members of the ever watchful Communist Party of the Russian Federation (CPRF) trailed behind as the march moved on. Raise the Red flags high. Along the way, the march came to a halt as a the people paid their respect at church. A brief ceremony ensued, and a few priests joined the procession. Members of the clergy anticipating the march with their wreath. Soon, the contingents reached the World War 2 Memorial Park of Kursk. People had already gathered to witness the event, as well as the mass media. The brass band marched on, uniform bodies lined up at the background. At the park, members of the rest of the contingents were held back from entering the park, as only the brass band marched on to reach the memorial site. They kept playing as they approached the destination. Close by, several regiments from various branches of the army had already assembled for the formal ceremony. The drill sergeant inspecting his regiment and shouting orders. Soon afterwards, a ceremony took place at the WW2 memorial site, where the Eternal Flame burnt at the foot of the WW2 Obelisk. The national anthem was played, a message was read, and branches of various uniform bodies including the church and large corporate entities laid wreaths to pay tribute in memory of the day the Soviet Union emerged triumphant. Then, regiments of the army performed a goose-step march pass before the one-minute moment of silence was held. It was a solemn ceremony. The ceremoney taking place in the presence of uniform personnel with the exception of the press. As the ceremony continued, the ever-present, ubiquitous and omnipresent propaganda van with hailing loudspeakers echoed the nostalgic sentiments of the past with speeches of patriotism and indebtedness to the departed heroes. The propaganda van – you can never miss it anywhere. After the ceremony ended, members of the public were allowed to move to the memorial site to lay flowers. The crowd was simply overwhelming. Although it was a bright sunny morning, the atmosphere was sombre. Flowers were laid at the Eternal Flame (at this photographic angle, the flames were not visible). Members of the Communist Party laid their wreath and held a vigil at the memorial site with flags of the USSR, banners and portraits of Joseph Stalin. The Great Leader immortalised himself through his iron-fist legacy. Nearby, the crowd moved on to lay flowers at the memorial monument of the tragic Kursk nuclear submarine which sank in August of 2000. The submarine was named after the city of Kursk prior to its tragedy. 118 crew members perished aboard the Kursk submarine. Veteran officers paid their respect to their fallen comrades by visiting graves at the memorial park, laying flowers and giving military salutes. Remembering the comrades-in-arms who fell in the line of duty. On the lighter side, war veterans were also in the limelight as people rushed to get photographs of them taken, while journalists hogged to interview them about their experiences of war and services to the country. Once a year, he gets to be on TV. Students and foreigners alike were impatient to have their photographs taken with heroes decorated with medals from head to toe. Asian chicks really dig old men in smart military uniform. At approximately noon, the procession came to an end as cadets on guard at the memorial monuments marched out from their posts. A few people lingered on and soon everything was over. They must be really smug knowing that I was photographing them. Didn't I say foreigners needed to have their photographs taken with veterans? I am inviting you to join BoL's Brain Pain. Don't worry, it's not as hard as what the title sounds.